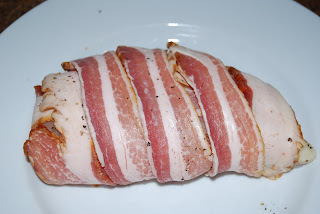 With the smooth side of the breast facing up, and beginning at a point under the breast to hold the bacon in place, wrap a bacon slice around the breast in a spiral. Continue with the remaining bacon slices, until completely wrapped. Wrap, tightly, with saran wrap and refrigerate, at least 30 minutes. Heat a nonstick ovenproof fry pan over medium heat. Add the chicken breast, smooth side up, and cook until lightly browned, about 3 minutes. Turn the breasts over and cook until the other sides are lightly browned, about 3 minutes. Turn the breasts smooth side up and transfer the pan to the oven. 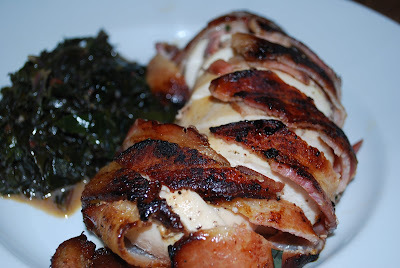 Cook until an instant-read thermometer inserted into the thickest part of the breast meat registers 165°F and the bacon is browned, about 20 minutes. Remove pan from oven and set aside, to rest, for 5 minutes. No, this is not an "everyday" meal...but Scott likes a little bacon every now and then.